(Health.com) -- Some children and teens are more likely than their peers to become addicted to the Internet, and a new study suggests it's more likely to happen if kids are depressed, hostile, or have attention deficit hyperactivity disorder or social phobia. Michael Gilbert, a senior fellow at the Center for the Digital Future at the University of Southern California's Annenberg School for Communication, says the findings were no surprise. And while Gilbert is not surprised by the research -- he regularly studies the impact of the Internet and cell phone usage on family relationships -- he says it's important that it is given the attention it deserves. But if at-risk children -- such as those identified in the Taiwanese study -- are given sufficient time and exposure without careful monitoring, Internet addiction could easily become one of the most chronic childhood diseases in America, says Dr. Dimitri A. Christakis of the Center for Child Health, Behavior, and Development, in Seattle. Our culture practically mandates time online, he says, with Wi-Fi connections in coffee shops and BlackBerries and iPhones that allow Internet access almost anywhere. "It would be as if we mandated that everyone drink two beers every day or everyone gamble for an hour every day," says Christakis. 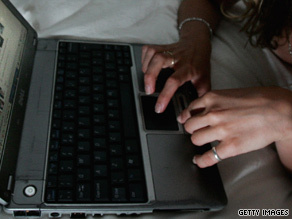 Since adolescents cannot easily avoid computers, treatment for addiction cannot simply involve abstaining from the Internet, says Christakis. Parents, educators, and medical professionals need to identify high-risk children early on and monitor their Internet usage to prevent problem behavior from forming. Time on the Internet needs to be monitored as well, especially for children who may be at high risk for addiction because of depression, ADHD, or social problems, says Christakis. "You can't tell a kid never to use the Internet the way you'd tell an alcoholic never to have a drink again," he adds. "But parents need to be thinking about what types of Internet or online gaming are particularly addictive. Ones that allow for continuous, real-time feedback are particularly risky." Teachers and health-care professionals should also take the potential for Internet addiction seriously, according to Christakis, who cowrote an editorial published with the study. "Our intention in raising this concern is not to be alarmist but rather to alert pediatricians to what might become a major public health problem for the United States in the 21st century," he writes. The National Science Council of Taiwan funded the study.